A comparatively new face to Durban audiences is comedian-singer-guitarist-drummer Gino Fabbri who is well-known on the Johannesburg corporate entertainment circuit. On the other hand, Ian von Memerty has been a much-loved and popular visitor to Durban stages for many years. 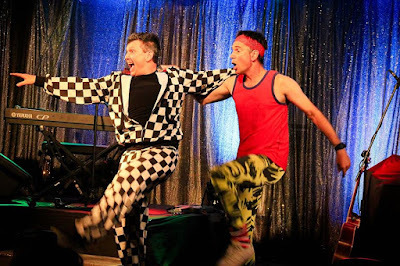 As owner of the nationally successful production company Centrestage, Fabbri approached Von Memerty last year and the pair produced an Elton John show together which toured the Eastern and Western Cape. Common & Class is a further collaboration which is set to tour South Africa. The show opened last night at the Elizabeth Sneddon Theatre to an energetically responsive audience. The stage is bare apart from a grand piano and a stool, with glittering curtains at the back of the stage changing colour as good lighting effects alter with the sequences. Elegantly dressed and speaking with an upper-class British accent, von Memerty is Class (that’s his name! ), a snooty performer with attitude. He smoothly moves into his first number, Beyond the Sea, only to be interrupted by a gawkish individual in bright red shiny trousers and a wildly-patterned shirt. This is Common (his name comes from his mother’s cry of “Come ON!” as he was being born). If there is a word he can mispronounce, he does just that, much to the audience’s delight. It turns out that Common intends sharing the show with Class but Class vehemently refuses. However, when he discovers that Common’s relatives - Bliksem, Moer and Klap - will live up to their names and do Class some serious injury, he reluctantly agrees to continue the show with this unwelcome partner. What follows is a complete madcap mix-up of well-known songs of different cultures, with the long-suffering Class playing classical pieces and Common bouncing around to pop songs, Boeremusiek and hiphop with wild uncoordinated gestures. Some of the medleys have little more than a phrase linking the numbers. I felt the drag sequence, Kimono Dragon, could have been shortened as could the scene where von Memerty and Fabbri play two old codgers sitting and chatting about old age and its problems. This is a very different von Memerty from the one we know, but his dance skills are certainly showcased in this production. From high kicks to hip-wriggling, he still impresses. One of the highlights of the show was his performance of Sweet Transvestite from The Rocky Horror Picture Show. If you enjoy loads of fun and utter nonsense in an evening of nutty escapism, then this one is for you! The production will move on to Johannesburg, Cape Town, Somerset West and George. Fabbri is due to perform a one-man show at Suncoast’s Barnyard Theatre in Durban in April.